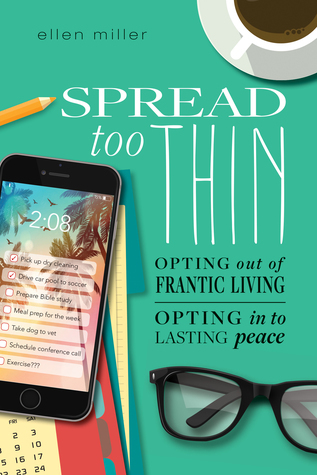 Spread Too Thin Opting out of Frantic Living Opting into Lasting Peace By Ellen Miller from Tyndale House Publishing. Between the breakneck speed of your job, the never-ending family activities on the calendar, the growing to do list on your phone, and the work out you been meaning to get to four weeks, it’s amazing you have time to breathe. Ellen Miller gets it and she wrote this book just for you. Whatever stage of life you find yourself in, you don’t have to live it frantically. Written for women who care deeply and extend themselves selflessly, this 90-day devotional offers an honest look at the obligations that drain us and then points us toward a more abundant life with Jesus. Through personal stories, practical insights, and Allen’s trademark humor, you’ll discover that it is possible to find hope and even peace! Throughout your demanding, sometimes overwhelming days you face ahead. My Opinion: This book offered a ton of ways to live daily and not feel so overwhelmed with your daily hectic schedule.